The Green Lanterns hunt for the murderer who’s stoking racial prejudice on Ungara as tensions mount. 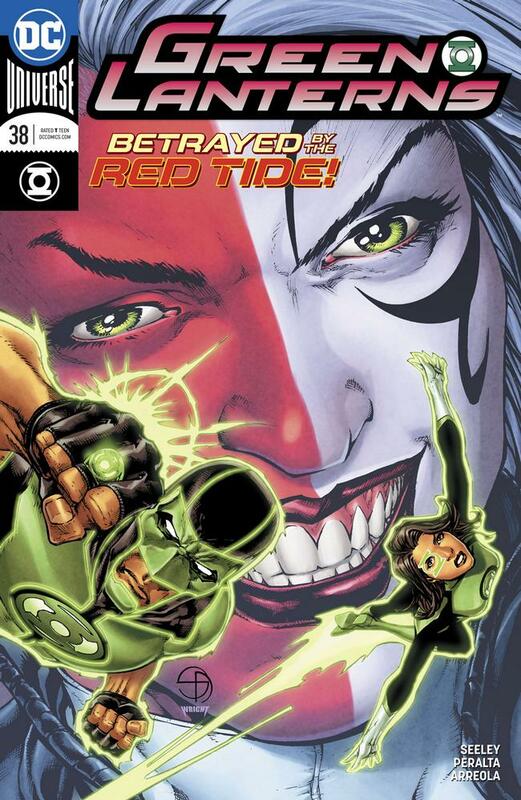 Green Lanterns #38 continues the story from the last issue, with Simon and Jessica assisting Regent Vok in her manhunt for Kesh Cur, the leader of an anti-refugee movement called the Red Tide. The Regent’s forces close in on Cur, only to discover he’s become more powerful than they had imagined. There’s a lot to like about Tim Seeley’s Green Lanterns. His arcs, so far, have been between two and three issues long, allowing for briskly-paced, smartly-told stories that don’t outstay their welcome. The dialogue is snappy and characterization is strong. Even as the plot moves quickly, we’re still given character moments for Simon and Jessica, including flashbacks, where relevant, to show a balance between the characters’ superhero and private lives. As if that weren’t enough, seeds of future plotlines are sprinkled judiciously throughout, creating a sence of continuity between the short arcs; this storyline, for example, builds on the story told in Seeley’s first arc in Green Lanterns #33-34. At the same time, sometimes the pacing feels a little too brisk. There are moments that feel like they could use a little more physical space to land. As an example, in this issue in the last panel of one page a character pursues Cur with her guards in the middle of the fight. In the first panel of the next page we’re told her guards were killed. How that happened does become relevant and is explored later, but the instant jump from a character walking off of one panel and getting a report on what’s happened to them some indeterminate amoung of time later in the next panel is jarring. A panel or two buffer could help to make the passage of time more seamless. As is, the pacing feels rushed. Then there’s the character of Liseth, whom I find completely baffling. Her motives are obscure, but presumably will be explored in the next issue, so I’ll reserve judgment on that for now. In the meantime, though, I’m at a loss to explain the way characters react to her (in part because a lot of their interactions with her seem to occur off-panel). The prior issue ended with the revelation that she’s secretly a member of Red Tide. By the time this issue starts, she’s evidently mended fences with the Green Lanterns and her mother to such a degree that she’s privy to their plans to destroy the Red Tide. How did she talk her way out of trouble? Unknown. It happened between panels, evidently. Certainly, we can intuit and fill the gaps on our own, but so much of the drama in this issue hinges on her shifting allegiances and betrayals of trust that it’s baffling that large parts of that story are cut for space reasons. German Peralta’s pencils and Ulises Arreola’s colors are quite well-suited to each other. There’s one scene, where Jessica and Simon fly into space for a private conversation while overlooking the world they’re protecting, that’s particularly striking. The choice of colors, reds and browns, for the planet below and the nebulae above creates a distinct look that’s eerily beautiful. Despite some issues with the pacing, this is a fine middle issue for this arc. It features some stunning visuals and excellent characterization to make a story that is highly entertaining, if mildly confusing.